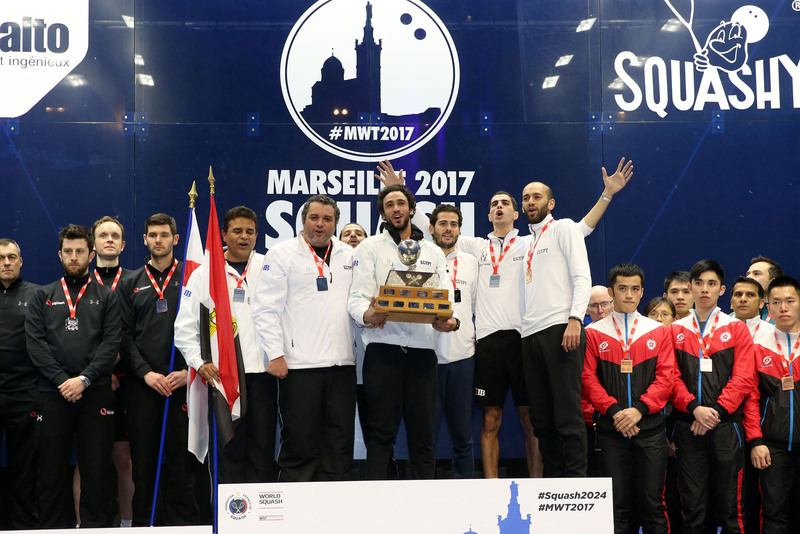 Egypt are the new WSF World Team Champions after defeating England in the final in Marseille. The defending champions proved no match for a power-packed Egyptian line-up as Karim Abdel Gawad and Ali Farag delivered the wins to give their team a decisive 2-0 lead. 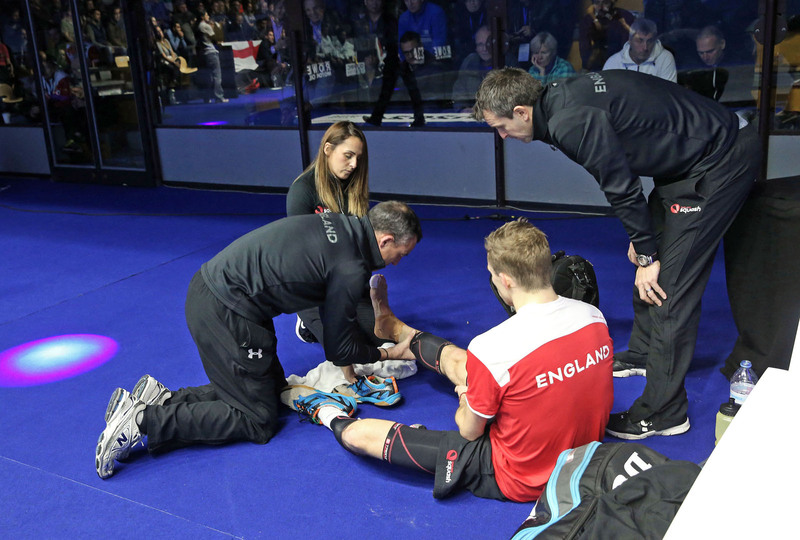 World Champion Gawad was first up against England's Nick Matthew and triumphed 11-9, 11-3, 11-7 in 34 minutes with 'The Wolf' seemingly hampered by an apparent injury. The pair were followed onto court by new US Open champion Farag who proved too strong on the day for England No2 James Willstrop, winning 11-5, 11-9, 11-5 in 36 minutes. 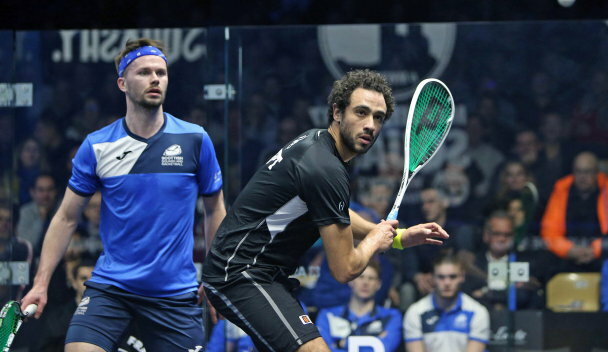 The victories for the Egyptian top two left Marwan ElShorbagy and Daryl Selby facing a dead rubber with the pair not required to take to the court. 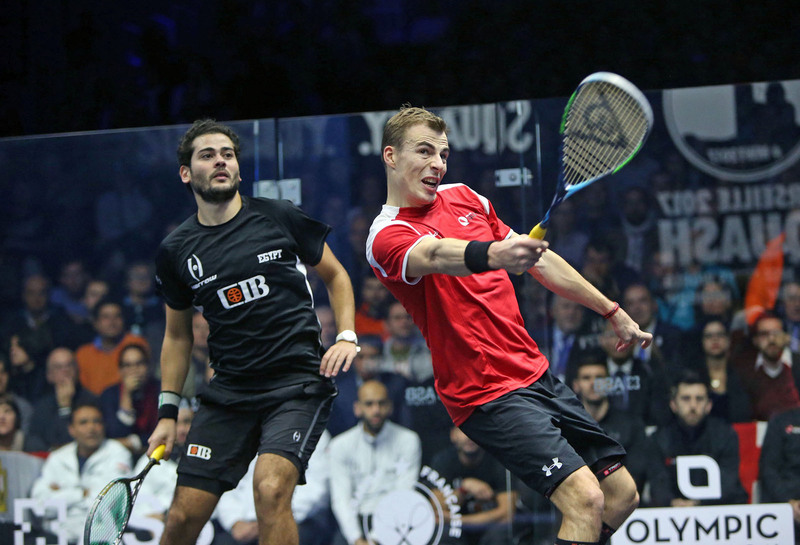 Defending champions England and top seeds Egypt will contest the final of the WSF Men's World Team Squash Championship for the third time in a row after prevailing in the semi-finals in Marseille. The victory over perennial rivals Australia saw England secure a place in the final for the ninth time since 1983. The two countries have won the title 13 times between them – and were clashing in the championship for the 12th time since 1983, with England narrowly ahead 6-5 before today's encounter. The teams' third strings took to the court for the opening match – with Aussie underdog Zac Alexander, ranked 126 in the world, facing world No.15 Daryl Selby (both pictured above). It was the pair's first meeting and Alexander saved a game ball in the first game before taking the lead 12-10. But Selby soon stamped his authority on the match, taking the next three games 11-7, 11-5, 11-7 to give England the lead. Aussie No.1 Ryan Cuskelly came into the second match after being taken to five games in a gruelling 97-minute encounter with Kiwi Paul Coll the night before. The New South Welshman faced Nick Matthew, the three-time world champion whom he had never beaten in four meetings in seven years. World No.6 Matthew delivered a masterclass in consistent squash to beat Cuskelly, ranked eight places lower, 11-8, 11-6, 11-4 (both pictured above) to clinch England's place in the final. In the opening match, Egypt's world No.5 Marwan Elshorbagy dropped a game before prevailing 11-3, 8-11, 11-4, 11-7 over the Hong Kong No.3 Yip Tsz Fung. The second match went the full distance – Egypt's reigning world champion Karim Abdel Gawad twice having to contend with fightbacks from Max Lee before beating his HK opponent (both pictured below) 11-9, 7-11, 12-10, 7-11, 11-7 in 67 minutes. 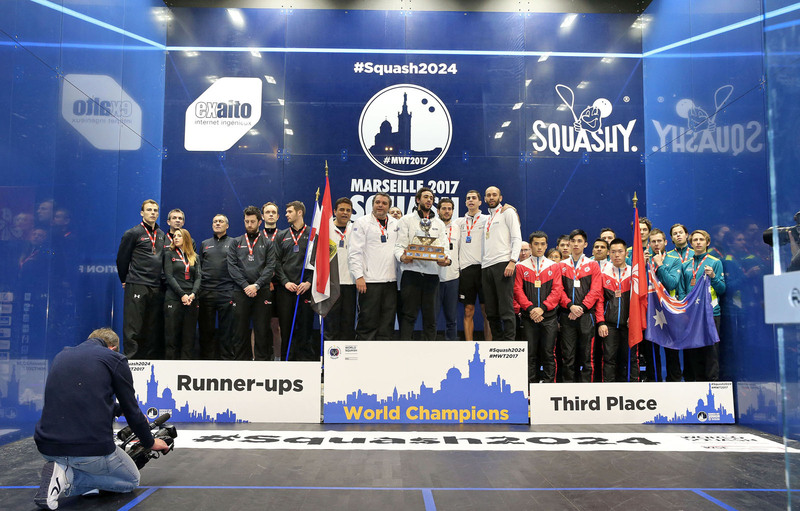 Hong Kong China relegated hosts France to their lowest finish in the WSF Men's World Team Squash Championship for at least 16 years after upsetting the hosts in the quarter-finals in Marseille. 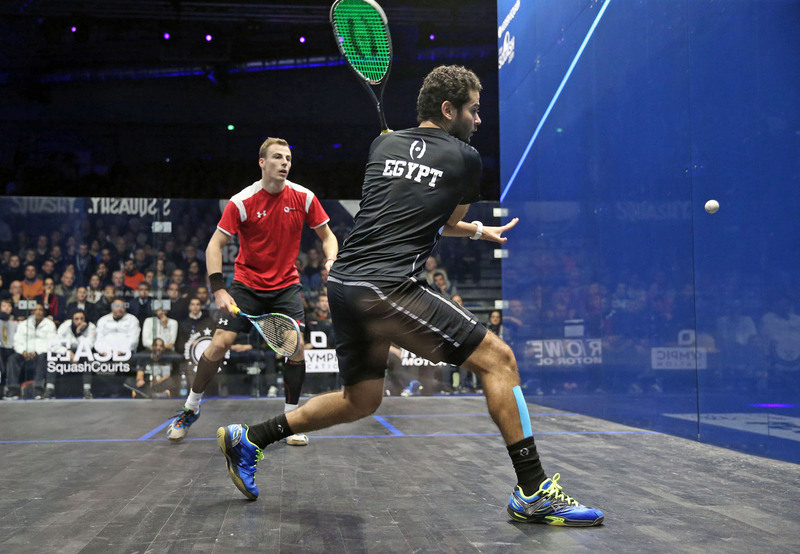 The third seeds, led by world No.1 Gregory Gaultier, were expected to survive this early encounter en-route to reaching their predicted place in the semi-finals, before then fully exploiting home advantage in Sunday's final by winning the title for the first time. The crowd went silent when Lee moved ahead to game ball at 11-10 – but the French 'General' was in no mood to drop his first game of the tournament and snatched the next three points to close out the match 11-6, 11-5, 13-11 to wild applause from the partisan crowd. 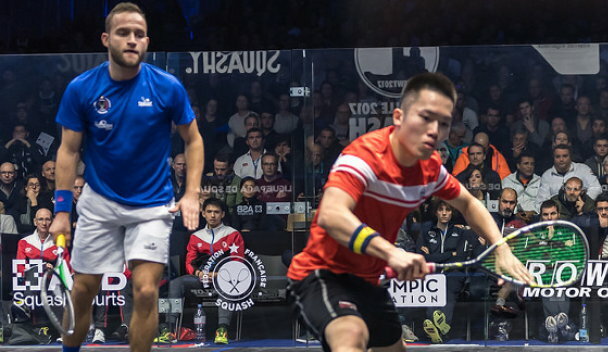 After celebrating this early lead, the crowd was silenced again when Hong Kong drew level when third string Yip Tsz Fung fought back from 2/1 down to beat France's world No.27 Mathieu Castagnet 11-7, 7-11, 9-11, 11-2, 11-4 in 67 minutes. The decider had the crowd on the edges of their seats – with home favourite Gregoire Marche facing four-time Hong Kong champion Leo Au with just seven positions between them in the world rankings. Event favourites Egypt, now boasting a squad with three players in the world top five (based on the new December PSA world rankings), cruised into the semis courtesy of a 3-0 win over surprise opponents Scotland, the 10th seeds. Karim Abdel Gawad put the three-time champions into the lead following a 12-10, 11-6, 11-6 win over Alan Clyne. Scot Kevin Moran had few answers to the mercurial skills of the 'Artist' that is Ramy Ashour as the former world number one took just 24 minutes to win 11-5, 11-9, 11-4. “It's an honour to be here,” Ashour (pictured above in Marseille action with Moran) told the crowd afterwards. Defending champions England, the No.2 seeds, were the first team to secure a place in the semi-finals – incredibly, the country's 18th successive appearance in the event's last four. But the five-times champions were given a hard ride in the opening first string match against eighth seeds India when Saurav Ghosal twice drew level with England's seasoned campaigner Nick Matthew (both pictured below) and, in the decider, was only points away from his first ever win over the former World No.1. When the two players clashed at match ball in the fifth, the referee awarded a let – which Matthew questioned, requesting a 'video review'. The video review official overruled the decision and awarded the Englishman a stroke, thus putting England ahead after 76 minutes in an 11-6, 6-11, 11-7, 10-12, 11-9 scoreline. It was Matthew's second five-game battle in a row after the 37-year-old world No.6 staged a mighty recovery from two games down in the last 16 round to beat Swiss number one Nicolas Müller. England will face Australia after the fourth seeds recovered from a match down to beat trans-Tasman rivals New Zealand. 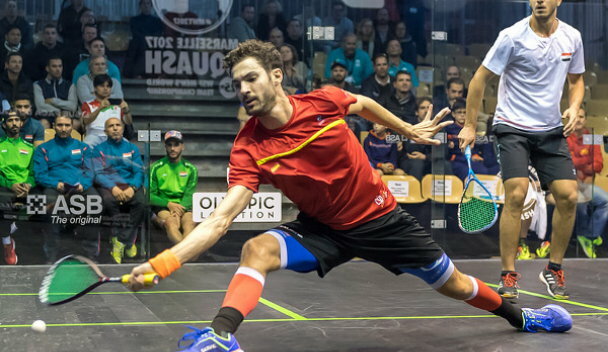 The top 16 seeds all eased their way through to the latter stages of the WSF Men's World Team Squash Championship in Marseille. Spain ended a 28-year absence from the top 16 after beating event newcomers Iraq 3-0 to secure second place in Pool E. With all the players facing each other for the first time, long-time top-ranked Spaniard Borja Golan led the 12th seeds to victory, supported by team-mates Carlos Cornes (pictured below in action against Mohammed Hasan) and Bernat Jaume. “For years we have been relying on Borja but now we have strength in depth with players like Bernat, Carlos and Iker (Pajares Bernabeu) – and others like Edmon (Lopez) who we left at home,” explained Jonas Gornerup, Spain's team manager. Competing in the event for the first time since 2009, Wales defeated Czech Republic 3-0 to ensure their place in the top 16. Number one Joel Makin put the 13th seeds ahead in the Pool D tie before Welsh second string Peter Creed beat Swiss Martin Svec 11-7, 7-11, 11-5, 12-10 to clinch victory. Whilst, 21-year-old event debutant Emyr Evans ensured maximum points with a straight games win over the 19th seeds' Jakub Solnicky. “We have to prioritise which world team events we play and haven't played this event for a few years,” explained Welsh national coach David Evans, a former British Open champion. “But with Joel at his highest world ranking and Peter and Emyr both playing well, we thought we could do well here. And now we've achieved our first objective, which was to make the last 16. “The 3-0 score of our defeat to Australia yesterday doesn't do us justice as it was very close. I'm pleased with today's performance as it shows that we can back it up. After upsetting higher-seeded India in their opening qualifying tie, ninth seeds Malaysia confirmed their supremacy in Pool H when they beat Austria 3-0. But the 23rd seeds gave Malaysia a fright in the opening match when Aqeel Rehman twice led Nafiizwan Adnan, the Malaysian number one who 24 hours earlier stunned top-ranked Indian Saurav Ghosal to lead the surprise result. Adnan raised his game, however, to close out the match 8-11, 11-8, 9-11, 11-3, 11-4 before team-mates Eain Yow Ng and Addeen Idrakie also prevailed to cement Malaysia's top 16 berth. “Today was tough for two reasons,” said Malaysian manager Major Maniam. The win sees Malaysia through to face Scotland: “At this stage all the teams are good,” Maniam continued. It was in Pool G that 10th seeds Scotland confirmed their place in the elite knockout stage by defeating Jamaica 3-0. The Scots took no prisoners – Alan Clyne, Greg Lobban and Kevin Moran seeing off their opponents, all making their debuts in the event, in straight games. The win saw the Scots finish as runners-up to Germany, the No.7 seeds. “I don't think it mattered too much whether we won or came second in the pool,” said Scottish team manager Martin Heath. “We knew we'd expect either Malaysia or India in the next round. “It's been a tremendous event for us and we haven't been overwhelmed at all: 3/0 scores can sometimes give the wrong impression! Finland survived the only tie decided by the third rubber when they beat 18th seeds Argentina 2-1. Olli Tuominen, the 38-year-old former World No.12 celebrating his ninth appearance in the championships, put the 15th seeds ahead when he beat Leandro Romiglio 11-9, 6-11, 11-9, 11-9 – but Argentinean Robertino Pezzota set up a decider when he beat Miko Äijänen in three games. “We were definitely slightly nervous about this match,” said Finland national coach Tomi Niinimäki. “I watched Argentina play England on the first day and they were good. Winning today is a big relief – we are really happy to be in the top 16. Seeded 14, Canada maintained their presence in the top 16 for the 22nd time since 1971 after beating Ireland 3-0. Team number one Nick Sachvie put the side ahead against the 20th seeds, beating Arthur Gaskin 11-7, 11-5, 9-11, 11-2 before Shawn Delierre and Andrew Schnell wrapped matters up with 3-0 wins. “We knew we would be challenged here and had to be ready,” said Canada's national coach Yvon Provencal. “Nick is playing his first worlds – and he is just fearless, and that's great for the team to see. Canada will face 4th seeds Australia for a place in the quarter-finals. The final places in the top 16 were decided in the evening: 11th seeds USA confirmed their place by defeating South Africa, the 22nd seeds, 3-0. After Todd Harrity put the Americans ahead with a 3-0 win over Thoboki Mohohlo, second string Christopher Gordon put the result beyond South Africa's reach after recovering from a game down to beat 45-year-old Rodney Durbach 9-11, 11-2, 11-7, 11-3. Durbach, the championship's oldest ever participant who made his event debut 22 years ago, commented: “I felt good after the first game – I hit my shots well, it was nice. “I didn't feel at all out of place. It was probably the length of the rallies that I wasn't used to – back home they don't last that long! “But I'm disappointed – I thought I could have done better. In the final tie of the day, 16th seeds Switzerland beat former champions Pakistan, the 17th seeds, 3-0 and will face defending champions England in a bid to reach the quarter-finals for the first time. Malaysia produced the first upset in the WSF Men's World Team Championship by beating India, the eighth seeds in the second qualifying round in Marseille. Playing in team order 1, 3 & 2, World No.21 Saurav Ghosal opened proceedings for India by taking on Nafiizwan Adnan, a lower-ranked Malaysian, to whom he had never before lost. 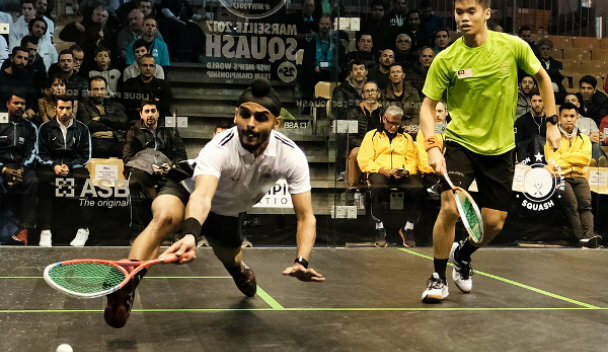 The Malaysian No.1 took the opening game before Ghosal fought back to forge a 2-1 lead. Adnan, the 31-year-old UK-based World No.31, drew level to force a decider – but twice again Ghosal led, 8-6 & 9-7. Teenager Eain Yow Ng, who, like Kamal, was making his maiden appearance in the championship, then faced India's experienced Harinder Pal Singh Sandhu, a 28-year-old from Chennai celebrating his fourth time in the World Championship. It was the pair's first meeting, but 19-year-old Ng was unfazed – and battled back from 2-1 down to overcome Sandhu 11-7, 5-11, 8-11, 11-6, 11-5 in 62 minutes to strengthen Malaysia's bid to top Pool H.
Malaysia's team manager Major Maniam, who only a year ago returned to his home country after a lengthy period as the Indian National Coach, was delighted with his team's performance: “With our No.2 out with an injury, we arrived in Marseille with a slightly weakened team – but Wan (Nafiizwan) and Yow were outstanding today. “And with Yow, what can I say! He played another very experienced player and truly lived up to our expectations. We were expecting a good hard fight. Hari just didn't have an answer in the fifth. Sixth seeds New Zealand were also taken the full distance before seeing off USA, the 11th seeds, 2-1 to ensure top place in Pool F.
'Superman' Paul Coll, the current World No.9, put the Kiwis ahead after beating US top string Todd Harrity, 11-9, 11-7, 11-3 – but Chris Hanson forced a decider when he defeated New Zealand's Evan Williams in four games. It took Campbell Grayson 58 minutes to finally get the better of US No.2 Christopher Gordon, winning 11-6, 11-3, 9-11, 11-7, much to the relief of his Kiwi team-mates. “It's the world team championship so the seeding doesn't mean much,” explained NZ team manager Kashif Shuja. “They have some great players and we knew it was going to be tough – and it was. Chris Gordon's sportsmanship really impressed me – that was a great match. “It's good to be in the last 16, but we are just going to take each day as it comes. It's a rest day tomorrow so we are going to relax and hopefully come back fresh. 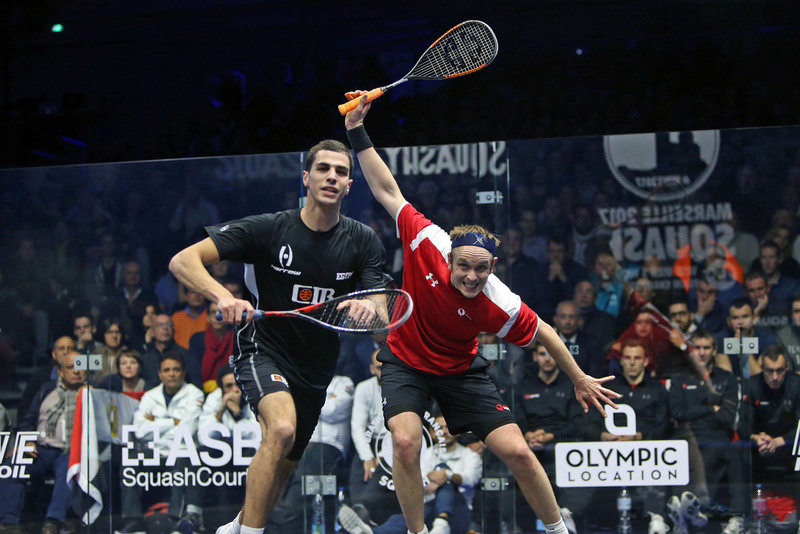 “Paul (Coll) has done a fantastic job – not just for himself but for squash back in New Zealand. The longest battle of the day took over four hours to resolve when fourth seeds Australia ultimately prevailed 3-0 over 13th seeds Wales. Left-hander Ryan Cuskelly, competing as the Australian No.1 for the first time, survived an 85-minute five-game encounter against fast-rising Welshman Joel Makin winning 11-9, 9-11, 11-5, 4-11, 11-7, before Rex Hedrick sealed victory for record eight-time champions Australia with a 12-10, 11-8, 11-1 win over event newcomer Emyr Evans in 54 minutes. “We knew Wales would be tricky to get past,” said Paul Price, the Australian national coach and a former World No.4. 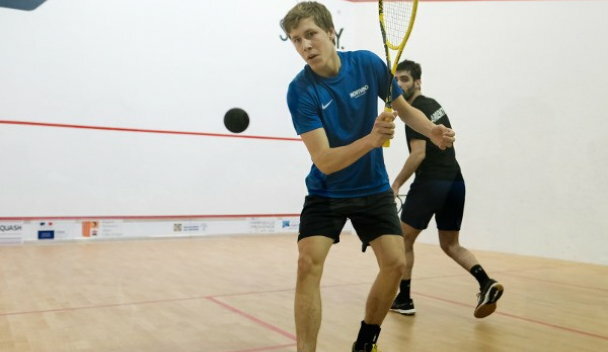 Germany eased into the last 16 with a second successive victory in Pool G – but this time the No.7 seeds dropped a match as opponents Scotland, the 10th seeds, claimed some consolation after going 2-0 down when second string Scotland's Greg Lobban beat Raphael Kandra in five games. German coach Oliver Pettke said: “I'm happy with the win – and it's definitely positive for the team spirit for the rest of the week. “It's always close with Scotland – and it's more difficult than the European Championships where there are four players in the team. Ramy Ashour made his first appearance in the 2017 championship when he helped favourites Egypt to a 3-0 win over Switzerland, the 16th seeds. Appearing in his fourth championships, he beat the tournament's youngest player Roman Allinckx, a 19-year-old, 11-2, 11-5, 11-5 to extend his all-time unbeaten record in the championship to 15 matches since 2009. “It's unusual for me to be the oldest player in the team and the fact that I've played in the event before makes it a little bit more comfortable as I know what to expect,” said the former World No.1 and three-time World Champion. Finland's record 17-time national champion Olli Tuominen also reached a notable milestone in Marseille when, in his ninth appearance in the championships since 1999, he played his 50th match. The former World No.13 went down 11-9, 11-7, 11-8 to long-time European rival James Willstrop as defending champions England eased into the last 16 with their second 3-0 win in two days. The top eight seeded nations sailed through their opening encounters on day one of the WSF Men's World Team Championship in Marseille, all winning 3-0. 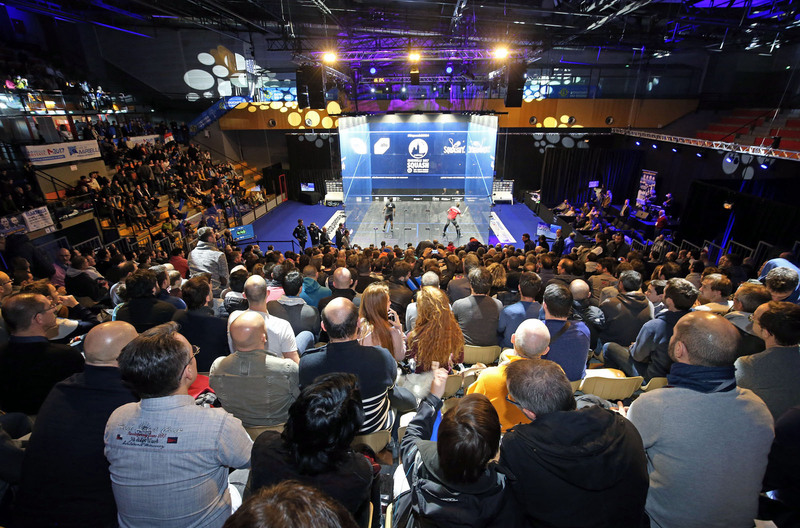 The 25th staging of the biennial World Squash Federation event is being held in France for the second time in four years. After qualifying rounds at Modern, knockout action from the last 16 round onwards will take place on an all-glass showcourt at Salle Vallier, leading to the final on Sunday (December 3). The event got underway with a confrontation between two of the giant nations of world squash: Egypt the top seeds looking to gain revenge for their surprise defeat to England in the 2013 final and win the title for a fourth time, faced Pakistan, who reigned supreme between 1981 and 1987, and have been champions six times in total – but in 2017 are the 17th seeds. Whilst the favourites come into the event with four players in the world top 11, underdogs Pakistan have a squad featuring only one player ranked within the top 150. With day's playing order set at 3,2,1, third string Marwan Elshorbagy, ranked six in the world, put Egypt firmly in the driving seat with an 11-4, 11-5, 11-6 victory over Amaad Fareed, the World No.162. 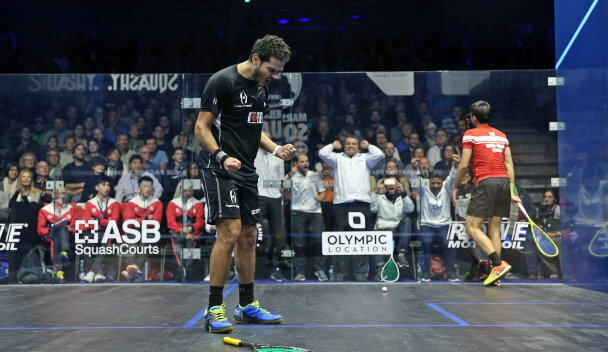 Fresh from making the finals of three major PSA World Tour events in the past six weeks, and becoming the U.S. Open champion, World No.4 Ali Farag sealed Egypt's overall win by beating Shahjahan Khan 11-3, 11-4, 11-9. It was in the third match that Pakistan secured their only game of the day when Farhan Zaman claimed the third against Egypt's Karim Abdel Gawad (both pictured above) before the World No.2 and current World Champion wrapped up the match 11-7, 13-11, 7-11, 11-4. “We would have preferred to play opponents like Pakistan in the second match – it's a pity that such a great squash battle happened on the first day,” said Ashraf Hanafi, the Egyptian National Coach. “We don't know their players – but we knew they'd be dangerous. It was a tough draw for Pakistan. “The most important thing for us is the team spirit – I know we have a lot of stars in our team, and it's important to respect that,” added the former British Open O35 champion. Second seeds England began the defence of their title in a tie against Argentina. The 18th seeds were making their seventh appearance in the championships, with a best-ever finish of 13 in 1995, while England, with five titles to their name, have never failed to reach at least the semi-finals in all 17 appearances since 1981. Third string Daryl Selby put England ahead with an 11-3, 11-6, 11-6 win over Juan Pablo Roude before team-mate James Willstrop took to the court with fellow 34-year-old Robertino Pezzota, the world No.94 from Argentina who recently became the Pan American champion for the first time. 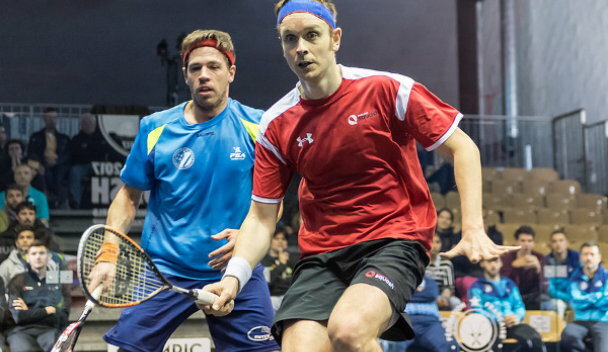 Earning his 151st cap for England, former World No.1 Willstrop battled for 41 minutes to survive a physical encounter with his Argentinean opponent, ultimately prevailing 7-11, 11-2, 11-2, 9-11, 11-6. 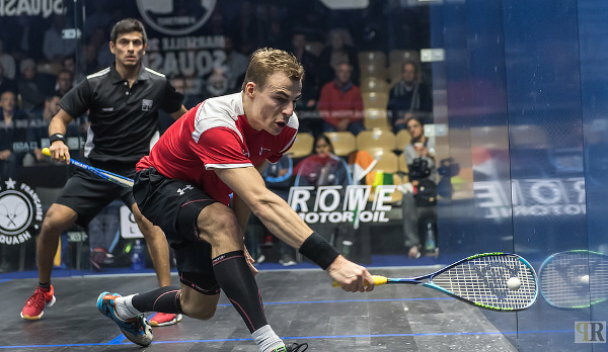 England No.1 Nick Matthew – like Willstrop, making his seventh successive appearance in the event – beat Leandro Romiglio 11-4, 11-8, 11-5 to give the team maximum points. The event welcomed a team representing Iraq for the first time in the tournament's history. The newcomers put up a commendable fight before going down to Hong Kong China, the fifth seeds, who are predicted to achieve their best ever finish in their 16th appearance in the championships since 1979. “I am very happy that Iraq is participating in this event for the first time,” said Ali Albawi, President of the Iraq Squash Federation. “This is a big day for us – we now have six players who are ranked by PSA and we are determined to do well. The Hong Kong squad, led by World No.28 Max Lee, achieved their 3-0 win under the direction of new national coach Chris Robertson, the former World No.2 from Australia, who was also the former national coach of Wales and later England. In the final session of the day, all attention was focussed on twice runners-up France, who are seeded three and bidding to win the title for the first time. The hosts faced European rivals Ireland, the 20th seeds whose best finish is 10th place. Event newcomer Lucas Serme delighted the partisan crowd with an 11-9, 8-11, 11-2, 11-7 win over Irish number three Sean Conroy, before Gregoire Marche also survived a four-game battle with Brian Byrne, winning 11-7, 10-12, 11-5, 11-3. The surprise first ever encounter between the two nations top strings saw the 'French General' and World No.1 Gregory Gaultier see off Arthur Gaskin 11-8, 11-7, 11-6 to end the day on a local high. “Ireland put on a good fight – and we needed it,” said French National Coach Renan Lavigne afterwards. “They played their top three and they tried their best – and we expected it. When asked what it would mean to win the title, Lavigne said: “We've never experienced it so it's difficult to imagine. I remember it was an unbelievable feeling when Greg won the world individual title and when we won the European team title after losing in the final so many times. The opening round fixtures for the 2017 Men’s WSF World Team Championship have been announced. The 2017 Championship will be screened LIVE and FREE on SQUASHTV to digital subscribers as the tournament takes place between November 27 – December 3 at Modern Squash and Salle Vallier in Marseille. Defending champions England – who denied Egypt a third successive title in 2013 – will face Argentina – who are taking part in their seventh Men’s World Teams – in their opening Group B fixture, which takes place at 15:30 local time. Three-time winners Egypt will open proceedings at the tournament as they take on Pakistan – who in the 1970s and 90s dominated the tournament and accumulated six gold, four silver and one bronze medals – in Group A. Other notable fixtures on day one sees eight-time winners Australia take on the Czech Republic in Group D, while host nation France – who are targeting their first World title after finishing runners-up in both 2003 and 2009 – will take on Ireland at 19:00 on November 27. Iraq and Jamaica are both making their debuts at the World Team Championships in France this year and open against Hong Kong and Germany, respectively. All pool matches will take place from November 27-29. SQUASHTV will be screening live action from the World Team Championships from November 27 to December 3 for free to Digital Subscribers. 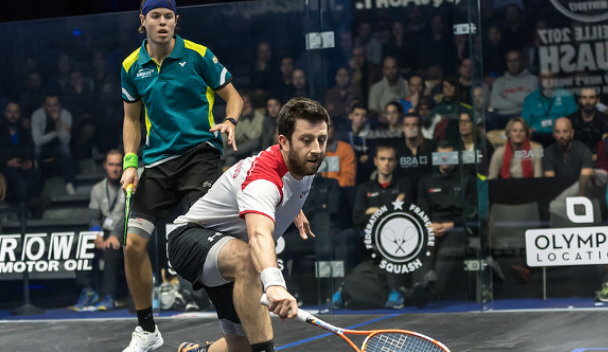 Sign up for a FREE digital subscription to SQUASHTV to watch the action! National Coach David Campion has revealed the squad that will defend England’s title at theWSF Men’s World Team Championships in France from 27 November to 3 December. The England quartet comprises Nick Matthew (Captain), James Willstrop, Daryl Selby and Adrian Waller who will be making his world team debut. The England squad has been hard at work training together over the summer at the National Squash Centre. And by way of further preparation for Marseille, the players will also be taking part in an England versus Rest of the World team match for men and women - including England’s leading lady Laura Massaro - at St George’s Hill, Weybridge on 24 November. “The World Team Championships is a very special event, which brings out the best in our players. We have fond memories from the battles with France and Egypt in 2013 where we were successful and I’m confident our players will be able to draw from those experiences once again. “I’m excited to be leading the team in defense of our World title. It’s fitting that the Championships are returning to France where we won in 2013, but we are under no illusions about the difficulty of our task facing us. The Championships will involve 28 countries with England facing strong challenges from hosts France, and also from Egypt who are tipped favourites.